A gorgeous natural oil from one of France’s leading brands of natural and organic cosmetics. I hadn't even heard of Melvita before but they specialise in natural beauty products. Their founder has a dedication to helping bees, which really appeals to me, Mel - vita originating from honey - life. 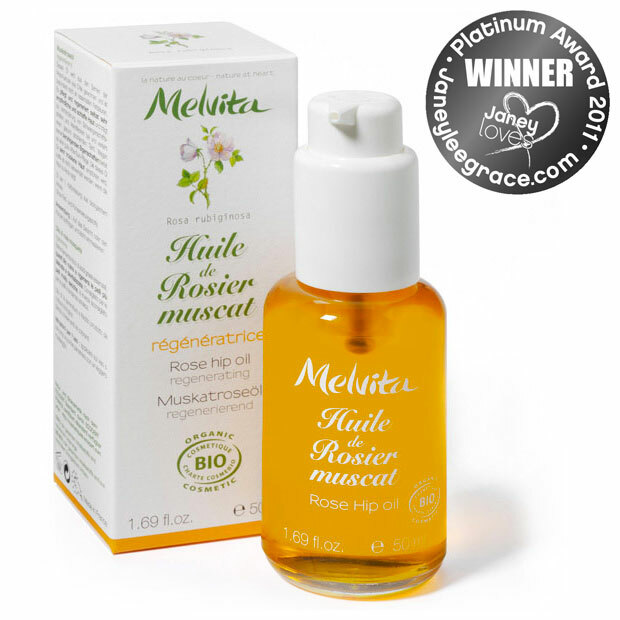 What was Melvita Rosehip Oil like? The Melvita oil was a much darker shade than the Rio Rosa Mosquta oil, being a deep orange colour. It was a little more viscous and had a stronger scent too, a nice floral kind of smell. I was surprised at how different the two oils were, given that they are both pure rosehip oil, but then I suppose you can get so many different variants of olive oil etc so not that weird when you think about it! Like the Rio Rosa oil it comes in a really easy to use pump bottle. How was the oil on my skin? I've been using the Melvita oil for the past week or so on my face and body. I have noticed the quality of my skin on my face improve and it feels so soft to touch - especially if I apply it before bed as well as in the morning. My eczema has been pretty good lately (not through using this product, this was the eczema state before the trial) but even on the patches where I am very eczema prone and always have a bit of extra dryness (like the crooks of my arms), the oil did not make me itchy - maybe the tiniest prickle on the back of my neck. I love this product. It's hard to say whether I prefer this or the Rio Rosa. The Rio Rosa goes a little bit further as it is more liquid and feels a little more refined, but the results from both are great. I cannot say what the product would be like on bad eczema, but as a facial moisturiser it's fabulous. My only issue with it is that around the eyes it can leave your skin looking a little shiny; I feel it accentuates my eye bags. This was the same for both brands of rosehip oil that tried. The solution is to apply more generously before bed, but only sparingly in the morning, or add a tiny dab of pressed powder under the eyes in the morning. If like me you despise all the mumbo jumbo around anti-wrinkle creams then I'd say bypass the lot and just use this beautiful 100% natural, pure oil instead. Or try it on stretch marks!